is an associate with the Law Offices of Thomas J. Lavin, P.C. Mr. Rodriguez received a Bachelor of Arts degree in psychology from Boston University in 1998. Subsequently he obtained his Juris Doctor degree from the Boston University School of Law in the year 2001. Mr. Rodriguez also earned a Masters degree in sports management from Columbia University in 2011. 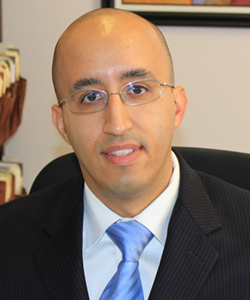 Mr. Rodriguez joined the Law Offices of Thomas J. Lavin in Bronx County in 2004. Since that time, Mr. Rodriguez has worked to provide dedicated and effective legal representation to scores of accident victims and their families in Bronx County and throughout the greater New York City area. He is admitted to practice law in the state of New York and is a member of both the Bronx County Bar Association and the New York State Trial Lawyers of America. Mr. Rodriguez successfully represents clients first by making sure they are fully informed with sound and accurate legal advice; he then works closely with clients, helping them make the legal decisions that are in their long-term best interests. Mr. Rodriguez believes that injury victims deserve full compensation for the losses they suffer due to the negligence of others, and he works diligently to achieve that goal for every personal injury client he represents. He aggressively pursues the maximum possible compensation for victims. During the last decade while working with the Law Offices of Thomas J. Lavin, Mr. Rodriguez has built an exceptional record of successful client representation as a personal injury attorney focusing primarily on motor vehicle accidents and construction accidents. His experience gives Mr. Rodriguez a huge advantage in representing accident victims; he knows how other attorneys and judges approach cases and conduct trials. Mr. Rodriguez’s record for successfully representing accident victims and their families speaks for itself.